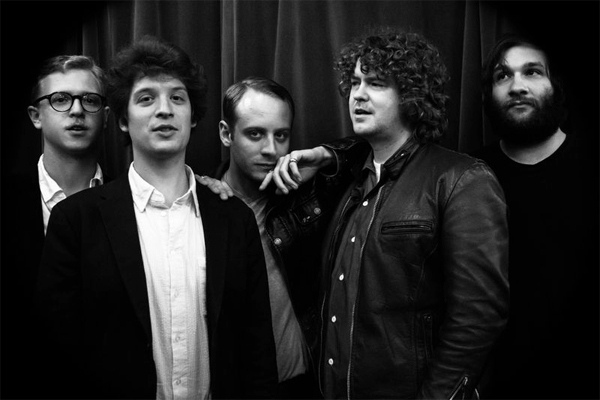 An almost unrecognizable John McCauley lingers behind his band-mates in the above photo promoting the new Deer Tick album Negativity, due on Partisan Records Sept 24. McCauley's newly exposed hairline, jawline and face - seem almost symbolic of the raw emotions and lyrical content within the album - mostly resulting from an ill-fated engagement to Nikki "Darlin" singer for Those Darlins. With crisp, clean production from Steve Berlin, McCauley's voice and songs are the focus of this moodier and reflective new album - and it suits the group - and perhaps appeases some fans turned off by the sloppier more spastic output from the group on recent albums and side projects. Noted highlight is the excellent pure country duet with Vanessa Carlton - a recent live collaborator - that serves as a point of levity in what is otherwise a dark but very rewarding album.